There are many different ways to mess up a career in art. You can do it the exciting way, the Toulouse-Lautrec way, by drinking yourself into early oblivion. Or the ponderous, long-winded way, like Charles Le Brun, who went on and on. Finding God is a certain killer: witness the trajectory of Emile Bernard. In England, the surest path to curtailed achievement is the acceptance of a knighthood, as Sir John Everett Millais, Sir Frank Dicksee, Sir Jacob Epstein and Sir Howard Hodgkin have found out to their cost. If the Establishment wants to hug you, you’re doing something wrong. But of all these flight paths to failure, the most frustrating of all, I reckon, is to be supertalented in your hands, but not in your head: to have so much down there and so little up here. 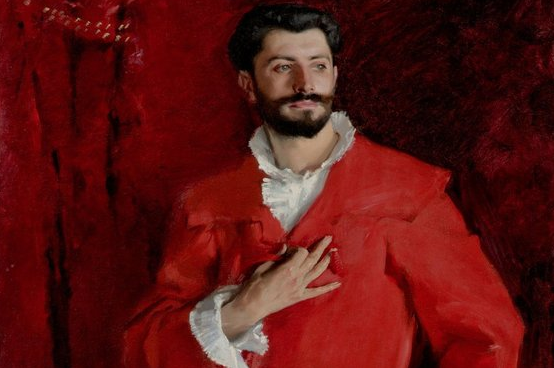 That was definitely the case with John Singer Sargent, the most fashionable portraitist of the Edwardian age, whose profoundly annoying career is being presented to us in a rousing display at the National Portrait Gallery. When I say rousing, I mean it got me muttering, hissing and cursing. How frustrating to encounter a painter who can be as brilliant as Sargent was when he captured the unexpected bleariness of Auguste Rodin. But who then found nothing of note — nothing! — in the huge expanse of red and black pictorial vacuousness that is his full-length portrait of Edwin Booth. There weren’t many telephones around when Sargent was in his artistic prime, from 1880 to 1910, but that didn’t stop him from phoning it in most of the time. Sargent was born in Florence in 1856, the son of peripatetic Americans with money. 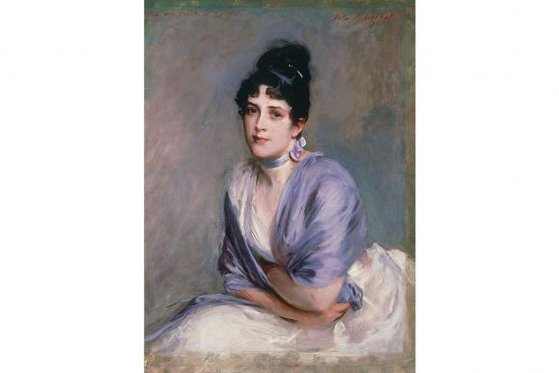 He studied in Paris under the showy Carolus-Duran, master painter of women’s gloves, then dabbled with various progressive French styles before moving to England, first to the Cotswolds, then to Chelsea, where he unhappily became Europe’s most desirable face painter. The unhappiness stemmed from a nagging sense that he could have been so much more. He knew it. We know it. The show does not examine the whole of Sargent’s career, but focuses instead on his portraits of artists and friends. By avoiding the shimmering society beauties who made him famous, the hope here is to confront us with a deeper, truer, more nuanced artist. It happens in a few places. But not often. Sargent’s address book was packed with the names of most of the notable creatives of his time, from Monet to Fauré, from Henry James to Robert Louis Stevenson. All of them were acquaintances at worst, friends at best, and all appear here with clear exhibition instructions to act as a corrective to the notorious image of Madame X popping out of her little black dress that caused such a stir at the Paris Salon of 1884; or the dangerous Lady Agnew, from 1892, with that Mae West look of hers that demands to know what you’ve got in your pocket. According to Sargent, in his most representative mode, the sitting rooms of Europe were filled with fin de siècle sirens toying with their Jasons. The present show generally glides over them, although the very first painting you see, of Madame Ramon Subercaseaux sitting at the piano, is a particularly gorgeous example of the genre. In theory, Madame Subercaseaux is here because her husband was an artist in Paris. But you don’t turn up in art in that dress, or lean back from the piano with that look, or exude this much delicious silvery elegance, if being a friend is all you are after. Frankly, I wish there were more of these flirty femmes fatales at this event, because they inspired a certainty of touch in Sargent. When he is not painting beautiful women in beautiful dresses, his art seems unsure what to do next. 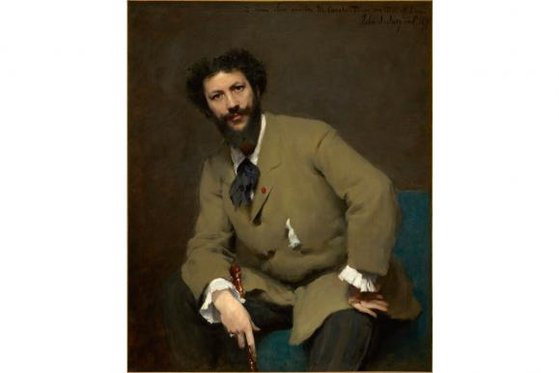 A couple of walls down from Madame Subercaseaux, there’s a row of three male friends, all done in the mid-1880s, all French painters, all shown from the waist or neck up, all strikingly different in style. The best of them, a strong, dark profile of Monet, seems content to remain thoroughly realistic and to show the great impressionist looking uncharacteristically solid. Next to him, however, Jacques-Emile Blanche is see-through and watery, while Ernest-Ange Duez, surrounded by huge white flowers on the other side, is one of those typical French presences of the postimpressionist years who seem to be playing second fiddle to their wallpaper. Three different friends. Three different approaches. All this is evidence of Sargent’s essential uncertainty, but also of his talent. One of the show’s best pictures is also one of its earliest, a spectacularly pretentious portrayal, done when he was still a student, of the spectacularly pretentious Carolus-Duran, sitting there with his frilly cuffs drooping out of his jacket, in a pose borrowed casually from one of the great Michelangelo prophets on the Sistine ceiling. As Carolus’s best pupil, the cocky Sargent isn’t merely painting his master. He’s duelling with him, too. Witness, too, the ludicrous but dramatic portrayal of the celebrated gynaecologist Dr Pozzi, as tall and thin as an El Greco saint, but dressed from head to foot in a dressing gown so fiercely red that you’d happily post a letter in its wearer’s mouth. All this coincided exactly with the first years of impressionism. Being young, moneyed and American, Sargent was drawn to the fringes of every Parisian revolt. Having befriended Monet, he briefly becomes a plein air painter and shows Monet at work on the edge of a wood. It’s impressionism of sorts, but as weak as the 10th cup of tea from the same teabag. Moving to England in 1886, he entered what was probably his most creative phase, attempting such wild poses and colour schemes in portraits of his arty friends. Among the show’s standout images is a tiny likeness of Robert Louis Stevenson, thin as a stick insect, pacing leggily round his living room while his wife sits in the corner enveloped in a gaudy Indian shawl. Weird. Unfortunately, as the commissions enlarge, so the invention drops off. Occasionally, when confronted by a genuinely intriguing presence like the baby-faced book illustrator W Graham Robertson, who looked 14 but was 28, Sargent is capable of a sudden flash of brilliance. But too often, in too many of the gathered dandies, the dashing brushstrokes fail to disguise a pedestrian reading of character. The display culminates in a ghastly room filled with images of fashionable society artists spending their summers in Italy, occasionally painting, more often dozing. One creative life after another, you feel, has slipped into terminal slo-mo, including, of course, the unseen painter of these grotesque scenes of lassitude. If all that was needed to be a great artist was quick hands and ferocious powers of assimilation, then Sargent might have been up there with his idols: with the Manets and the Degases. But quick hands have never been enough.